Audience: If you found something to like in Baldur's Gate, Planescape: Torment, or Icewind Dale then you should definitely go out and buy Baldur's Gate II: Shadows of Amn without hesitation. Don't think about it, just get it. I can't really think of any CRPG fan that wouldn't want this one unless you just absolutely hate an isometric CRPG or the use of the Dungeons & Dragons license. BG2 really covers all the bases so well, it's simply about as perfect a game as you're going to find on the PC. Set in the Forgotten Realms campaign of Dungeons & Dragons, Baldur's Gate II: Shadows of Amn continues the story of one of the offspring of Bhaal, the Lord of Murder, which just so happens to be the character you create at the beginning of the game. The game picks up several months after the death of the main villain in the original Baldurs Gate, Sarevok, in which time the city of Baldurs Gate has been saved from a war with Amn. The plot essentially revolves around your main character's continued struggle to understand the potential of his / her power. Your actions have consequences in the reaction of NPCs and party members to you in the form of dialogue options given to you. You do have the ability to import the character you played in Baldur's Gate or the expansion Tales of the Sword Coast should you wish, and this feature adds a nice touch that most gamers should appreciate that played the original with save files intact. So has the team at BioWare delivered another role-playing gem, or has the sophomore jinx caught up with the team? You can find out in our in-depth review of Baldur's Gate II: Shadows of Amn below, Enjoy! 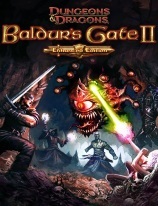 Baldurs Gate II plays similar to previous offerings published under the Black Isle Studios banner for their D&D licensed games. The biggest difference is the size of the game, and the nice mix of combat and quests. The introductions of a number of new character kits (about 3 per class), weapon proficiencies, classes, and even a new race have been implemented well. Also, the use of the D&D 2nd edition ruleset is very good as usual. Players are able to cast spells up to 7th level priest and 9th level wizard. Your characters start with 89,000 experience points, which equates to characters from levels 7th to 8th. The experience cap in the game is set at 2,950,000 allowing you to level your characters to a low of 14th (druids) all the way up to 23rd (thieves& bards). The rest of the character classes fall somewhere in between. Remember that 2,950,00 is the hard cap for experience point gain, so if you multi-class then your lump sum total of experience points will never exceed that. The interface is pretty easy to use, and not very difficult to learn. The available options for your character can be found at the bottom of the screen, with more information displayed on either side of the screen. Nothing more complicated than a few clicks will accomplish anything in the game, and the action can be paused at any point with relative ease as well. The game does stay paused now while you're digging through your inventory, which is a significant change from past titles. The high level of combat in the game is very challenging and similar to Icewind Dale, but much improved over the original Baldurs Gate. Combat occurs in real-time, while each character does have a delay for their next attack round. Through the correct use of the pause button, players can effectively make the combat seem like a turn-based system. Projectile weapons are still effective, but not nearly as much. Melee weapons appear beefed up, perhaps this is because of the higher quality of magic items found in the game. Although the use of melee or projectile attacks are definitely not lacking in punch, Baldurs Gate II favors the mage in most cases. Conjuring appears to still be the top school of magic due to the high saving throws major opponents have, and for the nice variety of creatures you can summon forth to do your fighting for you. As with previous Infinity Engine titles, a great journal is automatically updated as you progress with interesting information and quest entries. These entries are triggered by accepting / completing a quest or finding out something interesting from a NPC, and are separated by chapters. There is also a working map that gets put together as you make it to more areas, which makes travel easier especially later in the game. Speaking of maps, the running speed to get around these has been increased from Baldur's Gate, and the path finding AI, although far from perfect, is better as well. Unfortunately, you are not able to run in this one like you could in Planescape: Torment. Baldur's Gate II: Shadows of Amn offers up the familiar 2D isometric 640 x 480 resolution of past Black Isle efforts, but also adds the much talked about support for 800 x 600 resolution. Higher resolutions are available with a program called BGConfig; basically this program allows you to adjust many facets of the game including the graphics. At 800 x 600 the higher resolutions show off the artwork better, but the character avatars seem a bit too small for my tastes. At higher resolutions than 800 x 600 the game looks odd, so I wouldn't suspect many will try them more than once. As was the case with Icewind, the addition of 3D lighting effects using the OpenGL API is a welcome addition for a little extra eye candy, primarily for spells. The artwork is attractive, as would be expected for any BioWare / Black Isle Studios title, and there is an increase in dynamic backgrounds over past Infinity Engine games. The interface from Baldur's Gate has been given a new look, but the most part is almost identical to the original. A nice variety of attractive looking character portraits simply put the bow on a package that is sure to please most any gamer in this regard. The overall sound quality of Baldur's Gate II is superb. The sound effects and background music both hit their respective marks, and only add to the gaming experience. The character voice-overs for the narrator and many of the major NPCs were nicely done, and the voices available for your main character are decent. BG2 also features three-dimensional sound quality support for those who own sound cards that support EAX, which includes a really nice echo effect in dungeons as well. Baldurs Gate II is made with a focus on the single player game, with a variety of settings to adventure through. The settings vary from the Elven Forests of Tethir, the Cloudpeak Mountains, the Underwater cities of the Sahuagin, the pirate isles, the Astral Plane, cities of the Underdark, and even the Abyss (essentially hell). The few puzzles in the game aren't too high on the difficulty scale, and that feeling of what you need to do next is pretty straightforward. You might find yourselves lost by the number of things you can end up getting involved in very quickly, but the journal system takes those worries away as it is one of the best Ive seen to date for a game. A few times you might find yourself heading to a walkthrough like this great one at Sorcerers Place, but you will not need to do this very often. The flow of the game is nice, and the sheer size of the game is very impressive should you wish to do it all. The story is much better than what you found in Icewind Dale, but is a bit simpler than Planescape: Torments. Dont worry about having to read a book in this one to finish. The combat while fun and challenging was pretty difficult at times. Save early and often is the best advice I can give you. Strategy plays a key role in all these fights, so make sure you develop yours early in this one. Hide in Shadows and Invisibility spells are some of the best in the game to explore an area so you can get your party set for what they are about to walk into. Familiar NPCs Imoen (thief / mage), Jaheira (fighter / druid), Edwin (Specialist Mage Conjurer), Viconia (Cleric), and Minsc (Ranger) from the first game in the series make an appearance in Baldurs Gate II, and a whole slew of new NPCs make their debut as well. You have new characters ranging from the lovable gnome inventor Jan (thief / illusionist) to the axe crazed bloodthirsty dwarf Korgan. Although the game still favors those who are of neutral or higher alignment, there is the option to play a party that is primarily comprised of evil aligned characters. A total of 16 that can travel in your party are in the game. Should you do a lot of side quests, you can meet all these NPCs fairly early in the game. Each of the NPCs bring a unique personality to your party, and their own quest or two that you can help them out with. A lot of interaction with your main character and other party members is guaranteed, and there are four NPCs (three female and one male) that your character can romance. The quality of the NPCs in Baldurs Gate II is much improved over those in Baldurs Gate. Side quests in the game are abundant, and your character can become involved in many fairly quickly. In fact, if you played the game a few hours a night, you could easily spend three to four weeks in the large town of Athkatla alone without leaving the city gates. These side quests can range from fairly simple ones like finding an item for a NPC, to conducting an investigation on a religious cult in the area. Most side quests in the game are layered in that they build up to a final conclusion that might be totally different from what you began with. For instance, the aforementioned cult investigation will eventually become one in which you are asked to rid the area of the cult after you find out exactly what these deviants are up to. A large number of the side quests are fairly linear where the decisions you are given will just end the quest if you deviate from the path. However, there are larger side quests that have multiple endings. The one thing to keep in mind when doing large amounts of side quests is the reputation of your party. You dont want to be acting like a Paladin solving all the problems of the land, while playing with evil aligned or even neutral party members if you become too extreme. The same goes in the other direction, only it seems about 10x more extreme. Those party members that feel your reputation is unacceptable will simply leave your party, and a bit quicker than they would in the original. One reason for this change is to help do away with people running to churches to buy back their reputation through donations, although it is still possible if you are close. Baldur's Gate II: Shadows of Amn comes with full multiplayer support that allows for up to six different people to join a game, i.e. the six members of your party in the single player game. Supported connections include LAN, the Internet via a TCP/IP connection, and direct connections (two players, head-to-head, cooperative mode) via modems or serial cables. It should be noted that there is no difference in the single and multiplayer versions of the game. The person that begins the game must stay logged in for the session to continue. Similar to my gripes about this aspect of the game in Icewind Dale, the multiplayer experience is the worst aspect of BG2. However, due to the sheer volume of people who are playing the game in comparison to Icewind, it is much easier to find a good game to join up with. The network connections and services provided are not actually flawed in any way, but is very apparent that, as was the case in past Infinity Engine games, Baldur's Gate II: Shadows of Amn offers a far superior experience as a single player game than a multiplayer one. An extremely fun and addictive title that is sure to keep you highly entertained from start to finish. You just will not get a better modern day RPG experience on your computer than what you will get out of Baldur's Gate II: Shadows of Amn. The size of the game, the amount of replayability, the isometric engine (which I prefer), the artwork, etc. It just all adds up to a must play experience on your PC. Does it advance the genre? Yes. It's the best Dungeons & Dragons game made to date for the PC. Does it offer anything new? Yes. It combines the strong aspects of the original title and other D&D titles published since then with its own unique features as well. Does it offer a decent amount of gameplay? Definitely. Is the product relatively bug free? Yes, very stable for me. Some have had problems however. Does the documentation thoroughly explain the game? Yes, great manual. Does this game have any features to keep it from getting outdated? Yes. Is the game worth the retail price? Absolutely. Is the game FUN? Absolutely. Pros: Great artwork, attractive spell effects, nice soundtrack / sound effects, a multitude of magical items to be found, the new character kits, great storyline, large gameworld, replay factor high, and DRAGONS! Cons: Party AI pathfinding, although improved, still needs some work. There are some install issues that a few people are having, but once you do get it installed then it works fine on most systems. Everything we loved about Baldurs Gate has made its way into the sequel and much much more. The attention to the finer details of the game is apparent and much appreciated. The volume of quests, beautiful artwork, colorful NPCs, new character kits, and variety in settings all add up to one hell of a game in our book. Where the original failed to keep some gamers interested from beginning to end, Baldurs Gate II succeeds. Thank you Black Isle and BioWare. Its good to see a few developers continuously making games of such high quality. The Dungeons & Dragons license couldnt be done prouder by anyone else on the PC.